The La Sportiva Finale is a comfortable beginner / relaxed and durable multipitch climbing shoe designed with support and all-day wearability in mind. 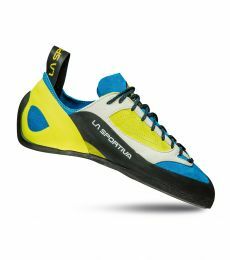 The sole of the La Sportiva Finale is 5mm, which is about as thick as they come in climbing shoes. This extra durability will be ideal for beginners with sensitive feet as well as multipitch or big wall climbers who are after a tough sole that won't wear down too quickly. The Finale uses the Vibram XS Edge rubber combined with La Sportiva's Powerhinge technology, the combination of which equals maximum power on edges and tiny footholds. XS Edge is a much harder rubber that allows for less deformation when loaded, meaning more stability and control. Powerhinge technology is a small hole cut into the sole that limits stretch to only the back half of the shoe, which provides even more balance on micro edges. The Finale uses unlined suede leather, so you can expect it to stretch up to a full size. La Sportiva recommend sizing this shoe loose for the best comfort. If you're looking for velcro, try the Finale VS. It's a little bit softer; a bit more ideal for gym climbing! I bought theses shoes for trad climbing. My Sportiva Miura VS are really great, but not comfortable enough for long multi-pitch day. Under the recommendation of Dave, I tried these, the rubber is the same as Miura VS, they are less aggressive but for not overhanging or crazy difficult route they do a very good job. I would recommend these for serious beginner to the advanced climber who needs comfort.